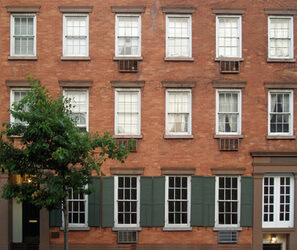 Incentra Village House, an Historic Inn, was built in 1841, and occupies two brick landmark townhouses in New York City’s Greenwich Village Historic District. As an attractive alternative to Midtown’s steel and glass, the Village House offers our guests a warm welcome in our cozy front office which boasts antique furnishings and artwork. All of our guests are welcome to relax with our supply of newspapers, magazines, and books. To get to your room you’ll wander down narrow halls and up charming old stairways to one of 12 unique rooms. Where: 32 Eighth Ave. at Jane St.